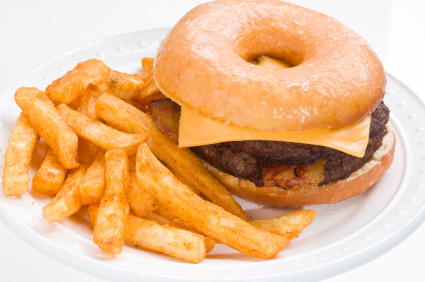 Nutritionists at the Center for Science in the Public Interest (CSPI) frequently visit America's chain restaurants to uncover examples of meals that have extremely high levels of calories, saturated fat, sodium, or added sugar. Their studies of the nutritional quality of movie theater popcorn, steakhouse fare, and Chinese food gained headlines around the world, and have helped many of us learn to be wary when eating out at restaurants. Since 2007, the CSPI’s Xtreme Eating Awards have become an (almost) annual tradition. The latest "winners" in the current issue of the Nutrition Action Healthletter included menu items from popular chain restaurants such as: The Cheesecake Factory, IHOP, Maggiano’s Little Italy, Chili’s, and Smoothie King. What they found is extreme by anyone's definition: A milkshake with a slice of apple pie blended right in, a 3,000-calorie plate of pasta, a breakfast of deep-fried steak and pancakes (and hash browns and eggs and gravy and syrup! ), a one-pound slab of chocolate mousse cake, a 1,460 calorie smoothie, and a bacon-cheddar hamburger with more calories and fat than THREE McDonald’s quarter pounders with cheese. Now, most of these diet-destroying menu choices are insanely large and most of us would avoid eating them—at least all at once. However, some of these restaurant menu items stealthily sneak in excessive calories by drenching their carbs in fat and oil. For instance, The Cheesecake Factory’s Bistro Shrimp Pasta entrée gets most of its 3,120 calories from the butter, cream, and oily batter. It contains more calories than most active adults require in an entire day (2,000—2,600) and FOUR DAYS worth of saturated fat. What is so offensive about this entrée is that many healthy people like me would not think they were blowing a week’s worth of cardio on the Cybex Arc by enjoying a single plate of pasta, shrimp, and arugula. Another scary Cheesecake Factory “winner” is the Crispy Chicken Costoletta. Granted, most of us know that fried chicken is an indulgence, but it is astounding that white meat chicken breast with mashed potatoes and asparagus can pack 2,610 calories into a single entrée. Again, here, the stealth calories and fat come from oil-drenched breading, oil and butter sauce, and nearly a stick of butter and cream stirred into the potatoes. I encourage you to check out the Center for Science in the Public Interest’s website at http://www.cspinet.org/ if you want more information on unhealthy restaurant menu items and healthy alternatives. A good Arc workout is a terrible thing to waist, er, waste. Use these tips to focus on healthy holiday eating.